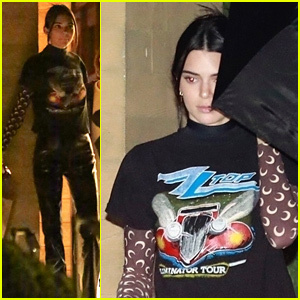 Kendall Jenner Wears Crescent Moons on Her Sleeves for Night Out With Caitlyn | Kendall Jenner | Just Jared Jr.
Kendall Jenner and Caitlyn Jenner enjoy some bonding time! The Keeping Up with the Kardashians stars were seen having dinner at Nobu on Thursday (March 21) in Malibu, Calif. They were joined by a few other guests and bodyguard. 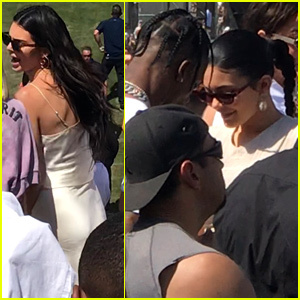 Kendall wore a graphic t-shirt over a long-sleeve shirt with crescent moons on it plus dark pants and earrings, styling her hair in an updo and carrying a to-go bag. Caitlyn rocked an all-black look featuring a bodysuit, pants, a jacket, a belt, and a purse. Kendall was seen hopping into the driver’s seat of her car after parting ways.